Honda CBR250R prices start at Rs. 1.65 lakh (Ex-Showroom). Honda CBR250R is available in 2 variants and 4 colours. Share your experiences with CBR250R? 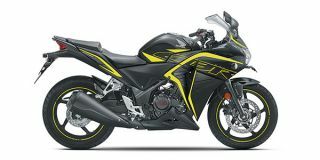 Q. Yamaha R15 V3, Honda CBR250R and Suzuki Gixxer 250 which one will be better? Q. Which one should I buy my options are FZ 25, CBR 250R, Bullet Classic 350 and Dominor 400? Q. I have to travel 220 KM (Malda to Balurghat up & down) per day. Which 150 CC to 200CC bike will serve the purpose, Roads are good and highway. You can go for Avenger, given the distance cruiser should be an ideal choice. You can also choose Pulsar 220F/NS200. Honda's Xblade is also a nice option. Q. There is any problem found in new CBR 250R? Q. My height is 5.5" is it comfortable for me? On the design front, not much has changed on the 2018 CBR250R. However, the key differences that separate it from the earlier versions is the all-black treatment on the alloy wheels, exhaust pipes and rear fenders. The 2018 version also gets an all-LED headlight as a major highlight, followed by a new set of graphics and a blacked-out instrument console as well. New colours include - matte grey, orange, gray and green, and yellow and red. Powering the new CBR is a new BSIV-compliant engine that is mated to a 6-speed gearbox. The 249.6cc single-cylinder, liquid-cooled engine produces 26.3PS of power at 8500rpm and 22.9Nm of torque at 7000rpm. This makes it half a PS more powerful with no change in torque figures when compared to the earlier model. The diamond-type frame is the same, with telescopic forks at the front and a monoshock unit at the back. Braking is handled by a 296mm front and 220mm rear disc brake, with dual-channel ABS on the higher variant. Bajaj Pulsar RS 200 ABS: The Bajaj Pulsar RS200 certainly scores a few brownie points when it comes to engine refinement and performance. It is also well loaded with nifty features such as projector headlamps with LED DRLs, a backlit semi-digital instrument console and ABS. All in all, those looking for an affordable, fully-faired bike with sporty characteristics, the RS200 is certainly an attractive buy. KTM RC 200: In terms of sheer track riding experience, the KTM RC 200 is still the best in its class. The bike received a facelift recently and is now BSIV-compliant as well. The updates make it even more tempting than before, but it isn’t ideal for daily use thanks to the stiff suspension setup and the committed riding posture. This blend, however, does make it fun to ride around the twisties. The Apache RR 310: The Apache RR 310 comes across as a welcome addition to the line-up of entry-level sports bikes in India. While it's far more accessible than the Benelli and the Kawasaki it does face some fierce competition from the KTM RC 390. So if you have a budget of around Rs 2.5 lakh and aren’t looking for something that is too track focused and want a good balance of everyday usability as well, then the Apache RR 310 should be the go-to bike. The Honda CBR250R is now Rs 13,000 costlier than the earlier STD version and Rs 16,000 costlier than the earlier ABS variant. With just the addition of LED lights as the only major change, the hike in prices is not really justified. Add to that the lack of power and torque in comparison to its closest competitor the Apache RR 310, which is a lot more potent. Be it the track, highways or running around in the urban jungle. The CBR250R is otherwise a fair bet to opt for, offering enough pep to keep you thrilled. It’s also got commendable highway and city cruising dynamics, which should make it a good everyday motorcycle. Especially with the more relaxed ergonomics, unlike the KTM RC 200. Love the bike. Only drawback is that no proper technician for cbr who can service the bike.